Carpetright was formed by Lord Harris in 1988 when he opened the first store in Canning Town. Since that time, the Company has grown to become Europe’s leading specialist carpet and floor coverings retailer with over 700 stores, trading in the UK, Republic of Ireland, Belgium and the Netherlands. By 1996, Carpetright had 246 stores, over two million square feet of trading space, a turnover of £185 million and a profit of £25 million. An investment in warehouse systems and infrastructure was necessary to maximise the efficiency and control of the operation and to support their ambitious plans for continued growth. Like many niche businesses, Carpetright’s warehouse operation has specific needs that cannot be fully met by an out of the box warehouse management system. Key to Carpetright were specific features such as maintaining carpet roll stock quantity so that they knew not only how much of each carpet they had but also how much was left on each roll, along with the installation of two automatic carpet cutting machines. To get the full benefit of such a significant investment and maximise throughput, these would need to be integrated into a WMS through custom interfaces. 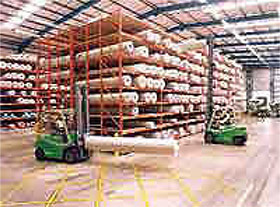 Specialised stock allocation routines would also be needed to minimise wastage from the expensive rolls of carpet that formed the raw material for their major product. With CALIDUS, OBS Logistics were able to provide a best of breed WMS with a comprehensive set of features and the flexibility to adapt to the changing needs of the growing business. In addition, OBS Logistics had the business experience and technical expertise to deliver a solution that could meet Carpetright’s specialist needs. The successful implementation of CALIDUS WMS and the ongoing partnership with OBS Logistics supported Carpetright’s continuing growth and in September 2005, Carpetright celebrated the opening of its 500th store in Cork, Republic of Ireland. In 2007 the number of stores exceeded 600, with a floor space of 4 million square feet. Group turnover reached £475 million and a profit of £67 million. To support this trading volume, the operation had expanded to occupy three warehouses using a total of four automated cutting machines, plus a distribution hub in Huntingdon. Plans were put in place to consolidate the warehousing and distribution operation from four sites into one super-site, which would provide central offices, cutting centre and distribution hub. The new site was a 500,000 square foot (46,000 square metre) facility in Purfleet. Five new cutting machines were commissioned, together with an extensive conveyor sorting system to deliver the cut rolls of carpet to dedicated store bins to support the in-house distribution function. Carpetright again turned to OBS Logistics to provide the CALIDUS WMS solution to support the operation of the new super-site. A scaleable operation able to support the continuing growth of the business and react to new business opportunities quickly and with minimal additional cost. Configuring CALIDUS WMS for the new site was simple enough. The challenge for the WMS was to exploit the new features and capabilities of the five new cutting machines to best effect. The new machines are each capable of performing 50 cuts per hour. As well as being highly efficient, the new machines have the ability to cut rolls of vinyl, allowing this facility to be brought in-house and realising further cost savings and reduced lead times for the service. OBS Logistics worked with Carpetright and their other suppliers to design an integrated solution in which CALIDUS WMS was interfaced to both the new cutters and sorting system. CALIDUS WMS was delivered on time and on budget and between January and April 2008, business was transferred from the four existing sites to the new super-site. CALIDUS WMS calculates how each roll of carpet needs to be cut to satisfy customer orders and minimise wastage of the expensive raw material. Then, when the orders are released, CALIDUS WMS Task Manager directs a pole truck driver to pick the roll and take it to one of the cutting machines. Each cutting machine has an operator who performs quality checks on the carpet and submits the cuts to the machine. CALIDUS WMS then sends the instructions for each cut to the cutter, which cuts off the ordered length then rolls and wraps it. CALIDUS WMS also prints a barcode label to identify the newly cut roll to the sorting system and sends instructions to the sorting system to direct the roll to its reserved despatch bin. One final task for the cutter operator is to attach the label to the end of the roll before loading it onto the conveyor sorting system. The new facility positions Carpetright well to support future growth of its business into the future. "CALIDUS WMS has supported our warehouse operations extremely well over many years and it was the automatic choice when it came to equipping our new super-site with the best solution. The combination of the standard CALIDUS WMS functionality together with OBS Logistics’ experience and capability in delivering solutions to meet our exact needs has proved to be the right choice for our expanding business".